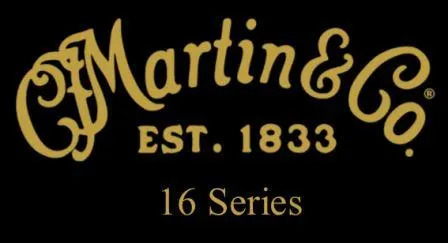 Below is my overview of the Martin 16 Series acoustic guitars. There are 6 different models in the 16 series and they all have more similarities than differences but there are some differences between the models, of course. Some might be more suitable for your needs than others. Prices range between $1,949 and $2,899. All prices below are in US Dollars and are the MSRP (Manufacturers Suggested Retail Price). Let’s take a look at each guitar individually. Starting with the dreadnoughts, let’s start with the D-16E. One of the interesting things about this guitar is that it features a Dreadnought body shape with an 000 body depth. So the depth of the body is 4 1/8″ (105mm) as opposed to the 4 7/8″ (124mm) on Martin’s standard dreadnought shape. The other interesting factor is the sycamore back and sides. This isn’t a common back and sides material. This model is new for 2017. This model is also new for 2017 and is essentially the same guitar as the D-16E except that it has a cutaway. The D-16GT is a more traditional dreadnought shape (with the normal dreadnought body depth). It has a gloss top finish with a satin finish on the back and sides. There are quite a few things that differ from the new D-16E model so it’s worth showing its specs here. So you are getting quite a different guitar compared to the D-16E, really. The D-16RGT is the same as the D-16GT in every way except for one major difference. It has East Indian Rosewood back and sides in place of the Mahogany back and sides. Which one you prefer comes down to the way you play, the genre you play and the sound that you prefer. The 000-16GT has all of the same specs as the D-16GT (with the Mahogany back and sides), except that it is a smaller body shape – the 000 (Auditorium) body shape/size. This is a fairly significant difference though as it brings with it different tonal qualities and a different feel. The difference in size is outlined in the table below. The OMC-16E is also a new model for 2017 and is more similar to the other new 2017 models (First 2 on this list) than the GT models above. It is the OM model of the DC-16E, essentially, but there a couple of differences other than the size/shape. It’s worth listing the specs here again. So the major difference between this and the dreadnought models is that it has cherry back and sides. There area couple of other differences too but otherwise it’s the same as the other new 2017 models but in the OM size/shape. With the introduction of the new 2017 models, the 16 series guitars are quite different but also similar enough to remain part of the same series. And you have the option of having a cutaway or a non-cutaway and the option of electronics, depending on the model. I hope this post has given you a good overview of Martin’s 16 Series guitars. If you think you’d prefer a Mahogany top but still want to stick with Martin and this is about your price range for a guitar, check out my overview of the 15 series at the link below.